Not to mention knitting. So much yum that gets jammed into some random scrap of the day because it's not as easy to put at the top of the list as, say, preparing a meal or getting to work or paying the bills. Ahhhh. 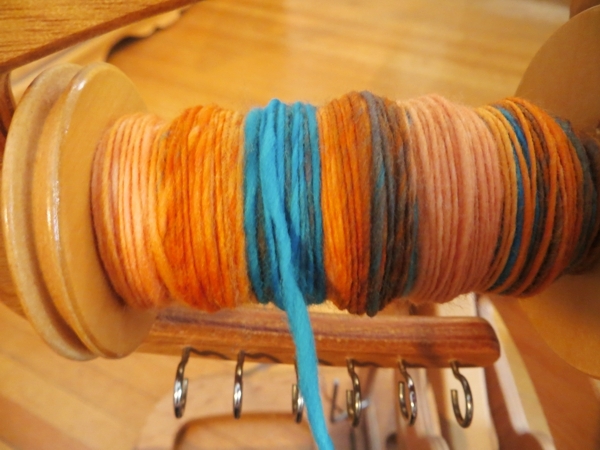 I feel so much less irresponsible now for sneaking away from my writing projects to knit or spin yarn. Bonus: at long last, I know what rock spinning looks like. And if you click on the video link, so will you! There is a mention here of the way our modern world's conveniences cut down on opportunities to touch natural things, including the availability of pre-chopped vegetables. You know, the pre-chopped vegetables that buy some of us our spinning time. Okay, let's all go touch some yarn, and meet back here tomorrow for some pretty Wednesday glamour shots. See you then!